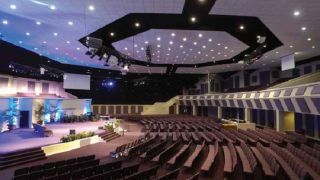 Though a move in 2007 to a 1,200- seat sanctuary in a majestic, dome-shaped building proved beautiful for the Fellowship Bible Baptist Church in Warner Robins, GA, that dome was something of an acoustical nightmare. Half-measures and a growing collection of loudspeakers only complicated the acoustical chaos until dB Audio & Video, of Gainesville, GA, implemented acoustical treatments and a Danley Sound Labs loudspeaker and subwoofer array. Johnson began by shooting impulse response measurements at a dozen locations around the sanctuary, which, together with a representation of the sanctuary in Bose Modeler, informed his plan for acoustical treatments and loudspeaker placement. “Our first approach was to knock 1.5 seconds off the reverb time by placing r30 and r32 absorbent material above their ceiling clouds, which, ironically, didn’t have any absorptive properties on their own,” he said. “Next, we treated the walls with 2x2 and 2x4 black panels that went up in three rows. At the top, the wall wrapping the dome ceiling started at 15 to 20 feet up. Next we covered the bull nose that circles the room, and finally, we covered the perpendicular walls that connected the bull nose to the floor.” In all, dB installed 155 acoustical panels. Moving to a 1,200-seat sanctuary in a majestic, dome-shaped building proved beautiful for the Fellowship Bible Baptist Church in Warner Robins, GA, but that dome was something of an acoustical nightmare. As important as the acoustical improvements to FBBC were, it was still critical to keep direct sound energy on the listeners’ ears and off the walls and ceiling as much as possible. Danley Sound Labs’ pattern control and efficiency would prove invaluable for meeting that objective. Just three Danley SH-96 loudspeakers provide main coverage, each with a Danley SH-95 for down fill. Three more SH-95s cover the balcony on delay, two Danley SM-80s provide corner fill, and two SH-60s provide mid-stage fill. All of the instrumentalists are on in-ear monitors, but the vocalists and speakers use the SH-60s. Johnson took advantage of cavities under the stage to install two Danley TH-118 subwoofers. Fortunately, dB was able to reuse all of FBBC’s existing Biamp Nexia processing and QSC RMX-Series amplification. Additionally, dB installed new HD video systems and infrastructures. “We wanted to give the church the ability to easily create a dynamic and engaging visual experience while at the same time keeping it volunteer friendly using a small number of personnel,” explained John Hogg, broadcast systems engineer with dB. The IMAG upgrades included two new Panasonic PT-RW630 laser projectors for congregational viewing and one Panasonic PT-DX500 for choir/ stage viewing. The HD camera upgrades included three Panasonic AW-HE130 Robotic cameras and a single Panasonic Studio manned camera for capturing the pastor. One Panasonic HE40 Robotic camera was designed for congregational and baptistery shots, and three movable POV cameras were used for close up interest shots for a total of eight live camera shots. A new broadcast video control room was designed and included a two-channel Clear-Com communications system, studio furniture, and an alpha channel graphics package utilizing a new iMac running Renewed Vision ProPresenter 6 software with a Blackmagic Design Ultra Studio 4K interface for lower thirds graphics. A new Blackmagic Design ATEM 2 ME broadcast switcher and 40x40 HDSDI router, HD streaming, HD capture, and a new HD modulated digital signage system completed the HD system upgrades.